The Airtricity League of Ireland season may only be three weeks old, but Mervue United entertain Finn Harps at Fahy's Field tomorrow evening in a top of the table encounter. 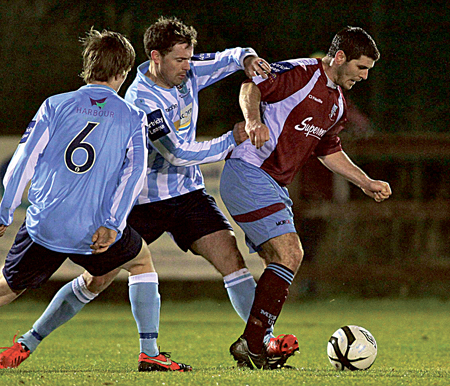 Mervue maintained their impressive start to the campaign blitzing Waterford United by four goals at the RSC. That result has injected confidence into the Mervue camp, but Harps are quietly fancied by many to launch a promotion bid so another difficult assignment looms for Johnny Glynn's team. against Harps it would be a significant achievement. Tom King bagged a brace for Mervue at the RSC, while Noel Varley and Jason Molloy also rattled the Waterford net. Admirably Mervue were clinical when it counted and that is precisely why theY sit proudly alongside Harps at the summit. Peter Hutton's squad is loaded with youth, but Harps have a couple of experienced players too supplying a drop of guile which is required in this tough environment. Harps' weekend win over Longford Town was a sign that the Donegal club are keen to make a serious bid to secure a berth in the top flight once more. Ciaran Gallagher, Keith Cowan, Matthew Crossan, and Shaun McGowan are others that have caught the eye for Harps recently. application is a challenge Mervue must embrace and they will be examined by Harps. against Wexford and they were eventually caught out in the closing stages. It was a disappointing defeat, but Mannion will be looking to Colm Horgan, Mixie Harty, Willie Enubele, Enda Curran, and Jean Biansumba to gain some kind of dividend from the Athlone fixture.